When Rick and I began our adoption journey (again…) back in October of 2012, we prayed fervently to our God that He would grant us a child. Specifically, a little girl in China. We possessed great faith that He would bring this to pass. And He did! We were granted the desire of our hearts in December 2012, with the referral of Dang Qi Qi, whom we would later name Faith. Her name comes from the faith that we held onto during those prayerful times of asking and persistence. Since 2010, China has permitted a seeking family to adopt two unrelated children at one time, but only if one or both children are labeled Special Focus, meaning they have more significant special needs. At the time that we were filling out our Medical Checklist form, we had checked the box that indicated we would be willing to consider the adoption of two Special Focus children. But we really felt at the time that we would be greatly blessed of the Lord if He would just grant to us ONE child from China, let alone TWO! We had also checked that we had no gender preference on the second child, and our agency had said that if we checked no preference, the second child would most likely be a boy. We were fine with that…we know boys well (since we have six of them!) and Rick really wanted another son anyway. So, we anticipated that if the Lord gave us a second Chinese child, it would be a boy. We received a call sometime in February, asking that we consider a little boy who was 13 months old. His name was Dang He Duo, and we laughed at the irony that he would indeed be our second referred child as his name indicated. We looked over his referral information and were thrilled that he was only 13 months old. That’s pretty young to be referred a Special Focus child! His special needs were prematurity and hypoxic-ischemic encephalopathy, meaning he had gone an unknown length of time without oxygen at birth. We dutifully sent Duo’s information to our pediatrician, who again spent several days looking it over. I actually got to speak to him face to face because we already had an appointment made for one of our other children. We had begun the paper-chase for Faith, and the children’s doctor’s appointments were one of the things we were working on. Our pediatrician’s advice was not good, however. He recommended passing on the referral, citing that there just wasn’t enough encouraging, affirmative information for him to foresee a positive outcome. It broke my heart because I had already begun to envision this child as my son, and because I have a heart that wants to take any and every orphaned child into my home. I have a hard time balancing what feels right and what is wise. With eight children already, one being a special needs child, the pediatrician’s counsel was to pass this child’s file on to another family that might be more prepared to parent a child with unknown future needs. Rick and I prayed about it and decided it would be best for everyone involved to not accept the referral of this little boy. I still pray for him and hope he has an identified family working toward bringing him home. A couple of months passed, and we began to wonder if God had a second child out there for us. On April 4th, 2013, I received another call from our agency. She asked if we would again be willing to consider another file. And that of a little GIRL! I was so surprised when I heard that! She told me that this little girl had just turned two years old and had been born with spina bifida, but was meeting all developmental milestones and could walk, though unsteadily. When she mentioned the spina bifida, my heart sank into my feet. I knew spina bifida was not something Rick was really comfortable with. We had checked “maybe” to it on our Medical Checklist form, only because we were comfortable with the most mild form of spina bifida. I thought that with this child being a Special Focus child, it was not likely that she had the mildest form of spina bifida. My immediate thought was that this was probably another referral that we would have to reject. I sent the information to my pediatrician anyway. It took him several days to review the file, as he was in and out of the office a lot at that time. When he did call me back however, he was very enthusiastic and encouraged about what he read. It seemed that this child’s spina bifida was a very mild form and he thought she was an excellent candidate for international adoption! I was so excited! Rick was not as sure though. He’s the cautious one in our relationship. He wanted to see for himself that she could walk. We requested that China send us a video of her walking so that we could make a more informed decision. China honored our request and sent a 3 1/2 minute video of her toddling around the room. She can walk just as well as any other toddler I know of! She is cute as a button. We applied for her pre-approval and received permission to adopt her in less than 24 hours! THAT’S REALLY QUICK! We see that as God affirming for us the decision to move ahead with adopting this precious little girl. And so, because we “hoped” for a second child…..
Hope was born in the Leihe City Yancheng District People’s Hospital, in the Henan province of China. She was born with a walnut sized sac on her lower back and was therefore abandoned in the hospital in which she was born. 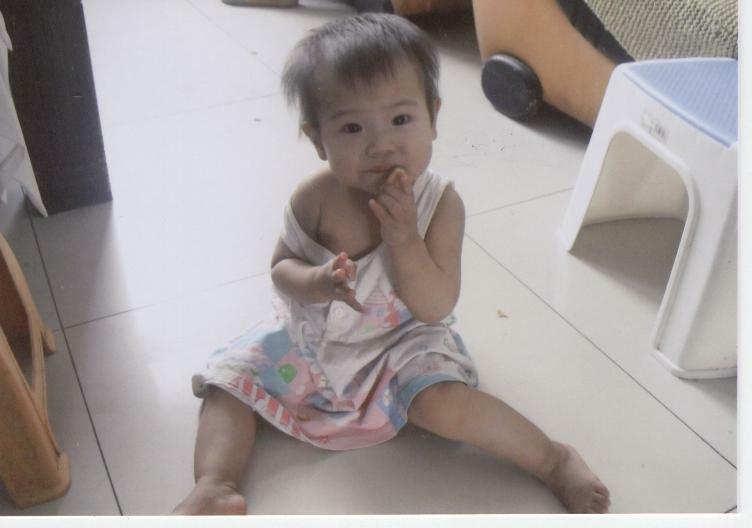 She underwent the corrective surgery for her spina bifida just shortly after her abandonment and it was very successful. She spent a month recuperating in the hospital and was then sent to the Luohe City SWI where she stayed for several months. On October 13, 2011, she was moved to a foster home where she currently still resides. Her foster mother and father love her very much. Because of their excellent care and devotion, we know our little girl will grieve much once she is placed in our care. We are praying that God gives us the words to speak and affection to give during those hard times. Her birth name is Dang Yi Han, but her foster father calls her YiHana in her video, so we plan to leave that as her middle name. It’s such a beautiful name! Hope is a shy, quiet little girl, who loves to smile, is fond of singing, and gets along well with others. She is a deep sleeper, does not like to be tickled, and loves to eat noodles, rice, and milk-based formula. We can’t wait to welcome our little girl into our family! Below is video taken by Hope’s foster dad. Please pray with us as we move into the last phase of adopting these two little girls….our “children of FAITH and HOPE”. SO adorable!! 🙂 I think she’s going to have you running! Keep the faith and never lose hope 🙂 God is waaaay bigger than all of satan’s snares. One thing we have learned in this journey is what we perceive as delays are often God orchestrating timing. When we lost one year in delays on this side and 10 weeks while in-country in Ukraine, I questioned everything and paced the floor. I asked God to please show me on this side of heaven why it had taken so long. The day we got Alex’s referral, 8 weeks after our arrival, and hard fought to the finish, we got the answer. He had only been registered, and thus available, for international adoption for 13 days. God was working the timing beyond what we could have ever imagined. He is working upstream in freeing these two precious girls…you just can’t see Him around the bend. Do the next thing and never give up. The day is coming…it may not be on your timetable but it will all be good. 🙂 Love you all!! Hope! What a perfect name! it was hard to get her started walking in the video, but when she started, she took off! what a cutie! And I’m betting a bit mischievous and stubborn too! It is exciting how God has worked things out.I can’t wait to see how the rest of the story unfolds. Thank you for sharing your heart and your struggles with us.I will keep praying that the God who has bought you this far will prepare your way to the end.